Abstract - Uptime Institute’s Tier Topology standard has been created to assure any organization can meet its required levels of business services by relying on a predictable level of performance in the data center. While power is one of the most critical resources used to operate any data center, the types of power utilized to operate that data center greatly influence the results achieved. With 20 years of incident data across more than 1000 data centers to draw from, the Uptime Institute Tier Standard asserts that onsite power generation is the only source of reliable power. 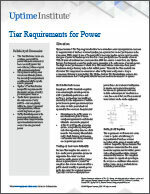 The high level of performance available from Tier certified datacenters stems from power distribution designs that rely only on this reliable power.